Entertainment for young people in the children’s marquee which will provide a range of activities to bring out their artistic side! Organised by Lincolnshire County Council, the last event attracted over 4000 visitors. Last years event was the first time the Heritage Skills Centre was open to the public and Woodhead Living were on hand to show visitors around the sustainable building and answer any questions from the public. 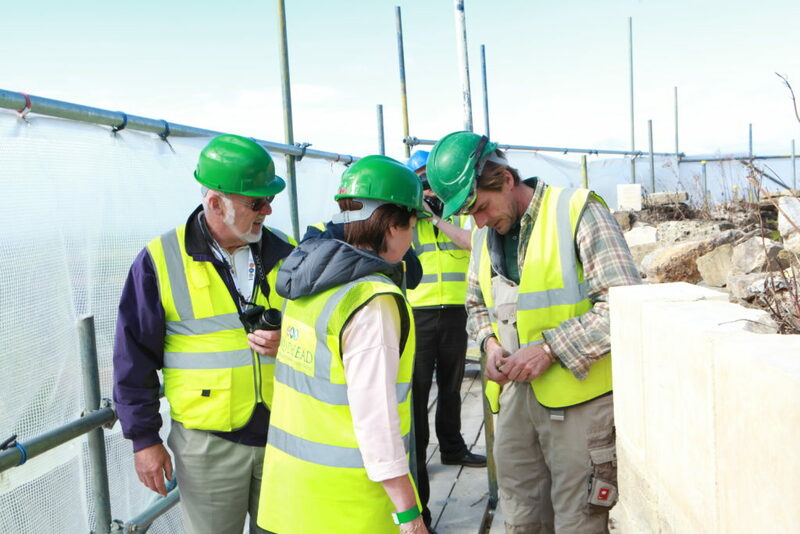 A small number of visitors were also given a behind the scenes tour of the Castle Walls Project by Head Stone Mason Heath Shakespeare (pictured) and Conservation Manager Simon Butler. Robert Woodhead Limited and Woodhead Heritage will be based in the Heritage Skills Centre where we will be demonstrating stone masonry and lead roofing, as well as answering questions on the Heritage Skills Centre and the work we are currently doing on the Castle Walls. We will also be undertaking tours of the castle walls for those with a head for heights! It is a weekend that all of the family can enjoy and participate in. Why not come along? Book tickets here.